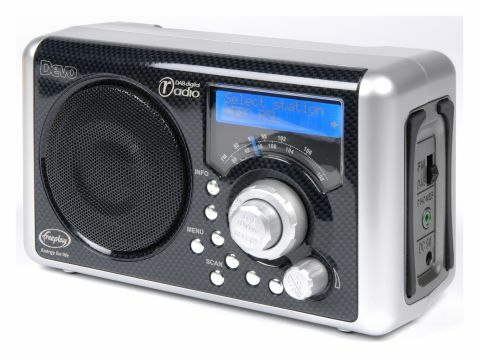 If you've been meaning to reduce your carbon footprint but haven't quite got around to restricting your holidays to the UK, this rechargeable DAB radio from Freeplay could be just the ticket. Using a fold away lever tucked into the back of the Devo, simply wind it round to enjoy FM or DAB radio on the move. A couple of minutes winding provides FM radio with over an hour of power, but DAB doesn't fare so well. Unfortunately, the charging is more gimmick than saviour because not only does in take about ten minutes exhausting winding to guarantee just half an hour of DAB (Devo claim that a 'full charge' supplies six hours DAB), but the internal battery charges up using the mains adaptor only very sluggishly - almost as if we'd actually prefer to wind-up the radio than not. That's largely down to the DAB tuner exclusively relying on the LCD screen, while FM frequencies rely on a dial - but that's all the more reason to allow a proper mains charge, surely. As well as being a chubby little fellow, the Devo's looks are purely functional. There are rubber sliders underneath the Devo, as well as on its side protecting the headphone jack and FM/DAB toggle switch. On its rear is a left/right line out for routing sound to another piece of equipment. A tough plastic casing is fronted by an oddly checked and rather messy looking black and grey fascia, with a blue LCD screen underslung with an old fashioned dial. It's a strange combination of modern and old. At least the controls are well placed: a volume control also serves as the off switch while two dials in one serve DAB and FM respectively: the inner dial juts out and controls DAB, while the outer handles FM. It's a well executed brief, although the plastic look of all the buttons - including the crescent of five DAB preset controls - doesn't help. Aside from the wind-up gimmick that might be useful if you're camping or out and about while the match is on, using the Devo Freeplay is a picnic. It autotunes in seconds and finds all the DAB stations on the local multiplex without any problems. Better still, switching between FM and DAB frequencies is easy to do using the side-mounted toggle, especially since those two dials remember which frequency/station they're tuned to when you return from FM to DAB, say. Not surprisingly, sound quality is also functional. Complete with durable cover grille that sits well with the Devo's all-round tough (if slightly odd) look, the mono speaker is heavy on treble levels, but is sufficient for handling voice radio. Keen campers and fans of FM might get some use out of this rechargeable radio, but for the rest of us it's all a bit of a wind-up. It's an interesting idea, but this little Devo is sadly no dynamo when it comes to DAB radio.